Scenario: You want to use Hyper-V Manager from a domain-joined Windows 10 Professional client computer to connect to a Windows Hyper-V Server 2016 which is a Workgroup computer (i.e. not domain-joined). I struggled for a couple of hours with this configuration, and read plenty of googled blog posts about how to do it. I wrote this post to document, the exact steps I finally followed to get this working as simply as possible. I’ll assume you’ve installed Hyper-V Server 2016 (the free thing from Microsoft which can host Hyper-V virtual machines. This is a non-GUI install of the Windows Hyper-V Server OS, and while you can administer it from the terminal window on the server, most people will want to manage it remotely from a client machine using Hyper-V manager GUI tool from another client machine running Windows 10 Professional or perhaps a full Windows Server 2016 machine. After installing, I left mine as a Workgroup computer because I did not want to join it to a domain, at least not just yet. 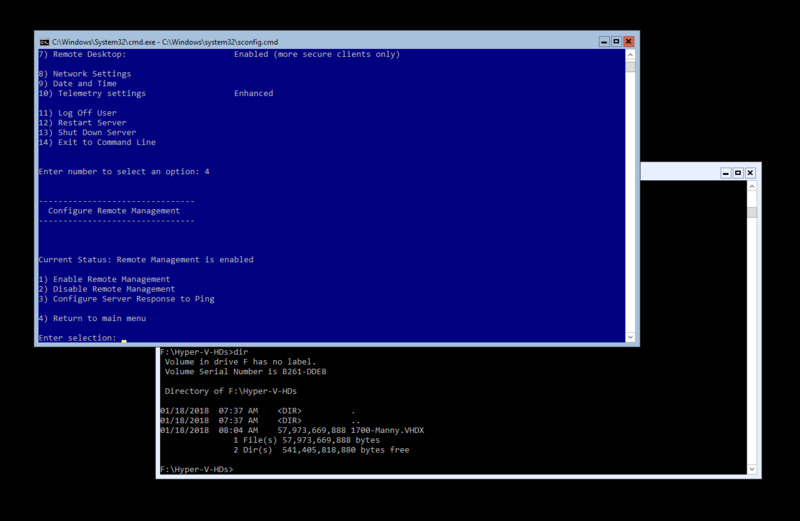 I’ll leave the basic setup from the blue sconfig.cmd screen up to you. I’m not going to walk you through all these baby steps in this post. The bottom line is that once you’ve enabled Remote Management and Remote Destkop, you can RDP from the client machine into the server (using the server IP address until you add fqdn in the your client hosts file later). “3) Configure Server Reposonse to Ping” and select to enable this feature. You should now be able to ping the server from any client machine on the next. Go to command window on a client machine and test Ping 192.168.0.55 (or whatever IP address you assign to your server. The above two values represent the IP address of the server and fqdn ServerName of your server. Modify values per your sever details. 4. Set-Item WSMan:\localhost\Client\TrustedHosts -Value "HVS1" (From Powershell admin console) Click YES when you get a security warning explaining what setting changes you are making. 5. 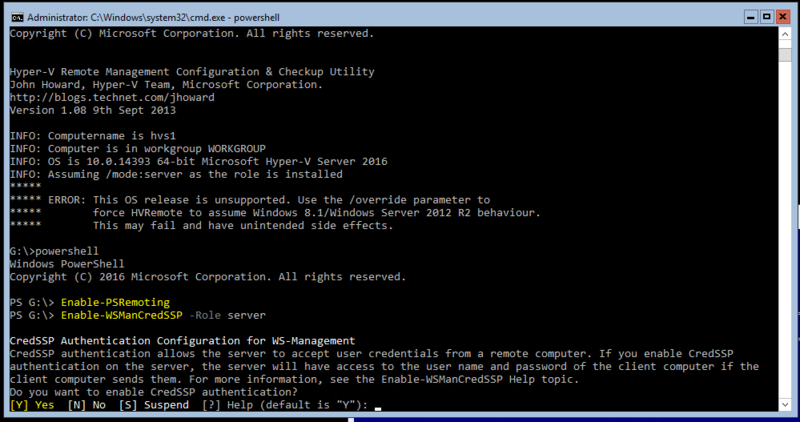 Enable-WSManCredSSP -Role client -DelegateComputer "HVS1" (From Powershell admin console) Click YES when you get a security warning explaining what setting changes you are making. Check “Connect as another user” checkbox. Final step to moving a VM from a domain-connect Windows Server 2016 to a Workgroup-based Hyper-V Server 2016 machine. You can run the Computer Management tool from a client machine to remotely access the Hyper-V Server with a graphical interface. If you want to use the Disk Management node in the Computer Management tool, you’ll need to enable some firewall rules on *both* the Hyper-V Server and the client machine. 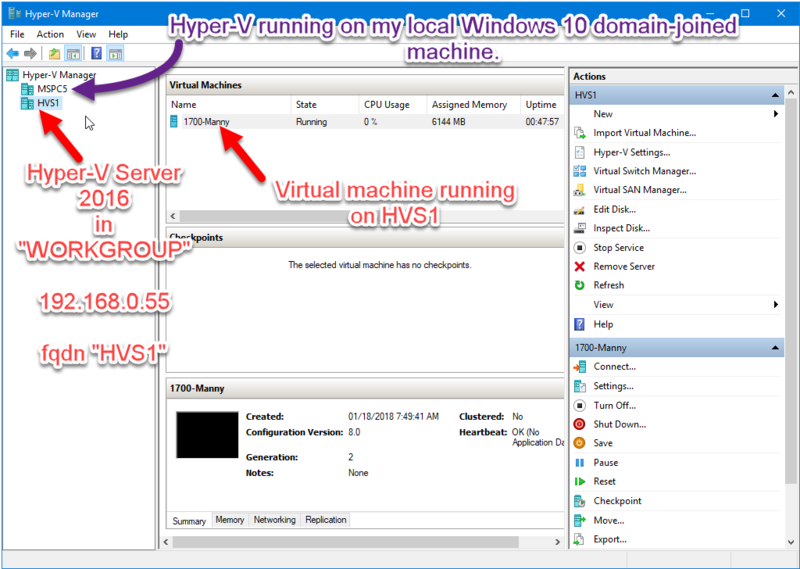 (Note: the “client machine” could be one of the Windows Server VMs you are probably running in Hyper-V Server). Watch out folks… Some of the Windows 10 updates between March 2018 and May 2018 add some new credential stuff to Windows 10, and if the Hyper-V Server 2016 is not also patched up the the same (or corresponding) level, you will get authentication errors trying to connect to Hyper-V Server 2016 from Hyper-V Manager on Windows, and it will even prevent RDP access from Windows 10 to Hyper-V Server 2016. Then, read Windows Key from “OA3xOriginalProductKey” property from output above. I found these 2 links very helpful and informative which explain how to use PowerShell commands to observe the current setting of Windows Defender and make configuration changes such as disabling and enabling, and how to add exclusions on certain apps. Set-MpPreference -ExclusionProcess "C:\Program Files (x86)\IBackupWindows\cmd_util\ibwutil_100.exe"